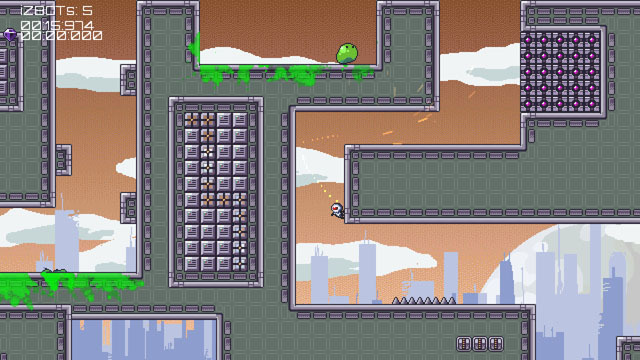 iZBOT is a precision platformer from Ruxar, designed along the lines of Super Meat Boy and Fenix Rage. The game stars a robot who hopes to bring peace to the world by ridding it of a pesky little outbreak of humanity. Typical of the genre, players must complete a series of platforming challenges in order to make it from one level to the next, and failure returns the player to the start of the level. There are 60 levels in total, plus three boss fights, as well as an optional pickup in each level to put expert players' skills to the test. iZBOT is currently available for PC via Steam. Check our full coverage here.